July 5, 2016 — Join us on Monday, July 11th from 9 a.m. – 2 p.m. when more than 50 of our students and other nearby centers will compete at the annual Hunter Jumper Classic at the South Chagrin Metroparks Polo Field. 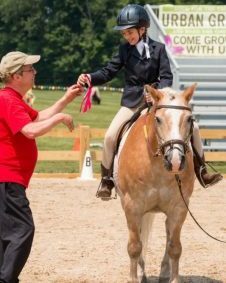 Students of all ages with a variety of disabilities and challenges will be riding and carriage driving in front of their families, friends, and community members.The show is a highlight of the summer as the students display their riding skills and celebrate their accomplishments on horseback. Don’t miss it!